In December 2016 Spyder Ryder of America was thrilled to add our newest chapter to the ever growing list of chapters for coast to coast. The new Orange County Chapter is serving the areas of Orange County California and well as the Los Angeles area. They are a VERY active group that loves to ryde. Look them up on Facebook and welcome them to the family. 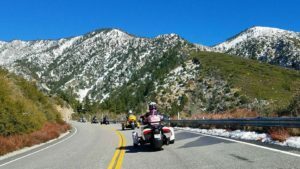 Here is a picture from their recent ryde to the foothills of the San Gabriel Mountains.